The ancient Japanese warriors from history were diverse and colourful, from the warriors we all known instinctively, to the lesser known Japanese fighter classes that often lie unknown. The Japanese warriors would all have one element in common, their dedication and skill in mastering their chosen art. Of course, we are all aware of the legendary Samurai warriors, and the skilful and elusive Ninja. But the Japanese warrior classes were much more diverse, from warrior Buddhist monks to the Ashigaru foot soldiers and the Japanese pirates the Wokou. So when you think of Japanese warriors, you should delve into the diverse mix of fighting styles, classes, honour that the Japanese warrior classes offer. 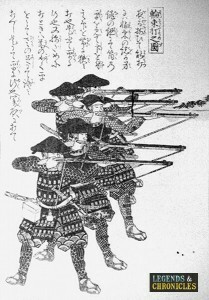 Ashigaru were foot soldiers for the Japanese samurai employed since the 1300’s. In feudal Japan during the constant wars, the Samurai number was not strong enough to win wars, and their was no national army. This is where the Ashigaru came into the equation. The Ashigaru started life as hired soldiers, with typically limited skills and a lack of training in war, the Ashigaru would provide the bulk of the army in conflicts like the Mongol Invasion in Japan. Armed with a variety of armour and weapons over time, the Ashigaru were always considered an army filler, not skilled or disciplined like a Samurai, the Ashigaru were a necessity for the time. The Samurai is probably the most prominent and well known warrior class of Japan and went through many changes over the feudal Japan period. 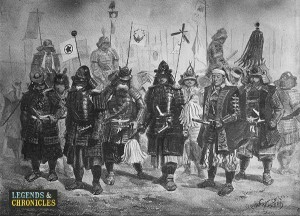 The early Samurai would fight in the feudal wars, or become bodyguards to tax collectors, using their skills for monetary gain. In later time the Samurai would become a more value based warriors, with ethics and their own code, which they would strive to live by. The Samurai armour and weaponry improved over time and they would become the well known figures we see them as today. The Wokou were coastline raiding pirates and the name literally translates to ‘Japanese pirates’ who operated in and around the 13th century. Legend has it that the Wokou were not independent pirates out for their own gain, but were controlled by coastal region feudal lords of the time, who used the Wokou to accomplish secret mission. The Wokou would carefully plan and implement raids from the coastlines and small islands off Japan, on trading vessels, and on countries like China and Korea, all with the goal of looting for their lords gain. The Sohei were the warriors Buddhist monks of feudal Japan. Throughout history the Sohei would find themselves embroiled in wars, offering advice, and fighting to defend themselves. They would teach their trainings in a brotherhood of monasteries and training temples, passing on their fighting and weapon skills to new recruits for the future success of the Sohei. While it’s easy to picture the Sohei as a shaven headed monk fighting in their robes, the Sohei were much more advanced and prepared than this. With feudal Japan bringing war and fighting to the fore, the Sohei were responsible for their own safety and protection, this lead to their evolution as warriors. 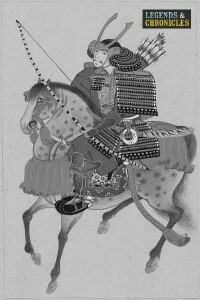 The Sohei would be armed with similar weapons to a Samurai, wore armour like a Samurai and would fight in a similar fashion. One key difference would be the use of the naginata, a large polearm weapon with a curved blade at the head, which would allow the Sohei to easily disarm or attack horse riders, like the Samurai. The Yamabushi are a group of Japanese mountain hermits that believe in life with abstinence form earthly pleasures, who followed the Shugendo beliefs and way of life. Yamabushi literally translated means ‘one who lies in the mountains’ but the words Yama which means ‘mountain’ and the word bushi which means ‘warrior’ is probably a better interpretation of their name. The Yamabushi were long thought to have supernatural special powers, which led them be viewed as both spiritual and mystical, just adding to their allure and mystique. In addition to being deeply philosophical and spiritual people the Yamabushi were also skilled in combat. Martial arts was common for them and in a similar fashion to the Sohei the Yamabushi would also carry swords and wear armour, and were almost as deadly in a battle as a Samurai. The range of Japanese warriors was diverse through the feudal periods, the diverse mix of skills, beliefs and outlook on life lead to this diversity. From the dominant Samurai, to the Wokou pirates and the Buddhist warrior monks the Sohei, each class of ancient Japanese warrior was sufficiently different. Whatever class you would come up against in battle, the ancient Japanese warriors were all deadly foes to face in a battle.